Plantronics Calisto Pro is a telecommuters best friend. 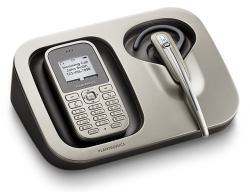 - Headsets Direct, Inc.
Plantronics Calisto Pro is a telecommuters best friend. We recently began selling a very unique headset solution for people in a home office environment. We’ve been testing it around our office (we play with every new product extensively so we know how to recommend it) and it’s pretty impressive. Bottom line: it offers a combination of three things no other quality headset offers. One, wireless connection to your landline. Two, it pairs (Bluetooth) with your cell phone. And three, you can take VoIP calls on your computer. The headset is commercial grade, lightweight, offers noise canceling and our testers tell me it’s comfortable enough to wear all day. You have a small remote keypad to carry or clip to your belt which has caller ID and all of your typical phone functions (plus you can save 200 of your Outlook contacts to the unit). It also has a decent speakerphone when you don’t want to use the handset. When using the unit with your computer, VoIP applications work great, however, you are not able to use the headset in place of your computer microphone and speakers for standard computer use and music listening. By using one headset for three different modes of communication you can simplify devices and eliminate extra charging all with one unit. Click here for more info, or you can call and talk to Al, he’s done the most testing on the unit: 888.244.0483.